Please be advised: If your bank returns your check payment for any reason YOU WILL BE CHARGED A RETURNED ITEM FEE, late payment fee, and have financial holds placed on your registration and transcripts. For additional information about our policies, visit the Business Office Policies and Deadlines. HPU DOES NOT ACCEPT PAYMENTS OVER THE PHONE. Make your check payable to “Hawai'i Pacific University” and be sure to include your student ID number (beginning with the @ symbol) clearly written on the check. If your name is not printed on the check, please write your name on the check so your student account will be properly credited. If we are unable to verify the student's account, we will return the check to the sender. This may cause your student account to have financial holds which may stop you from registering for future courses, viewing your grades, or ordering transcripts. Payments must be received by the Business Office by the tuition due date (see the Academic Calendar). Payments received after the due date will be subject to late fees and holds on your academic records. TUITION IS ALWAYS DUE 2 WEEKS BEFORE THE START OF TERM. 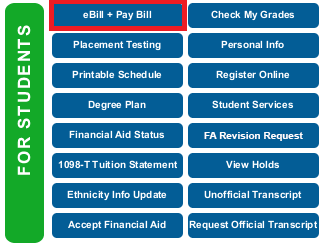 After logging into Pipeline, http://campus.hpu.edu, click on the “Ebill + Pay Bill” in the Quick Links under the My HPU tab. This will take you to the Account Payment page. 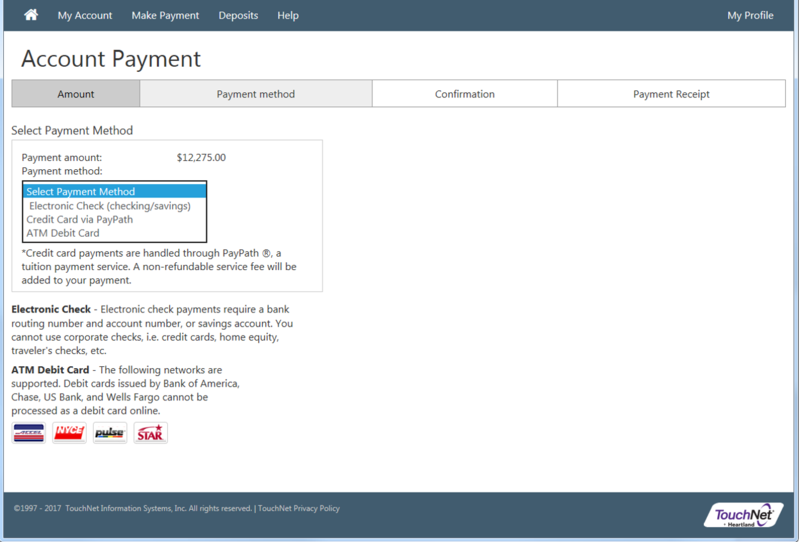 Select which payment you want to make under “Select Payment” – Amount Due or Pay By Term. 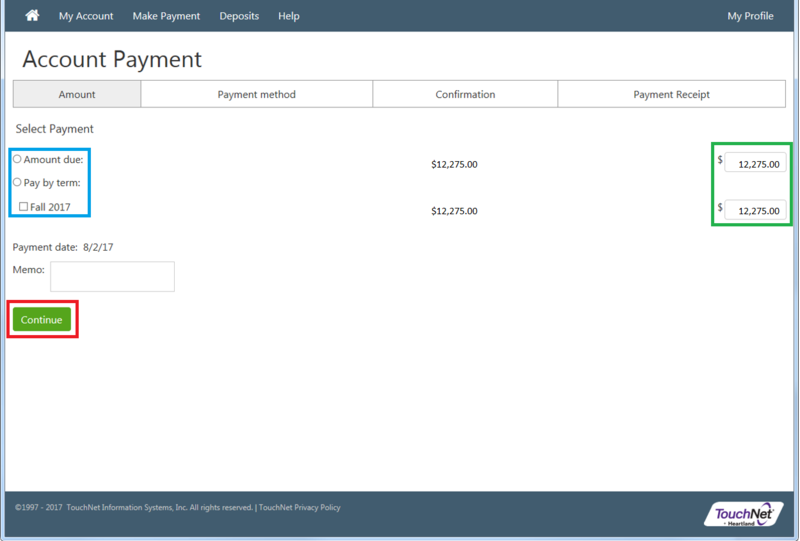 If you want to pay an amount other than the auto-filled amount already shown, click in the corresponding box on the right side of the page and enter the amount you will be paying. (Optional): You may also enter a memo at this time. Tuition and related charges may be paid online by eCheck from your US checking or US savings account. This type of payment results in an electronic debit of your bank account. Some banks do not allow this process – please confirm with your bank allows this type of transaction before proceeding. An ACH/electronic check is still a check. As with any check, please allow up to three (3) weeks for the funds to be transferred from your bank to our bank. A bank routing number, account number, and HPU student ID number are required to complete an eCheck payment. Before making an eCheck payment, please verify your account information and that your bank allows electronic debiting on your account. Payments may be returned by banks for many reasons including but not limited to: a lack of sufficient funds; the use of an incorrect or invalid bank routing or account number; the account has been closed or frozen; the account is a non-transaction account; or if the bank does not participate in automated clearing house (ACH) transactions. If your bank returns your payment as unpaid for any reason, YOU WILL BE CHARGED A RETURNed ITEM FEE, late payment fee, and have financial holds placed on your registration and transcripts. Should you have additional questions about our policies, please view the Business Office Policies and Deadlines page. If you have authorized your parents or guardians to view your tuition statement online, they may make eCheck payments to your account by logging into: http://myebill.hpu.edu. Credit cards (Visa, Master Card, America Express, and Discover) may be used to pay tuition and related charges. Paying with a credit card will assess a service charge for its service. It is available 24 hours a day, 7 days a week via the Internet and the vendor’s secure server. If you have authorized your parents or guardians to view your tuition statement online, they may make credit card payments to your account by logging into http://myebill.hpu.edu. Using a debit card DOES NOT incur a service charge. The following four banks CANNOT be processed as a debit card; other banks may also apply. HPU offers an easy and secure method of sending international payments through Flywire. For further information and fees, please visit Flywire. Eliminate hidden bank fees and ensure Hawaii Pacific University receives the correct amount. Save on exchange rates – in most cases you can make a payment in your home currency. Flywire will process the currency exchange, offering you wholesale exchange rates, unmatched by traditional banks. Have Peace of mind. There is 24 hour multilingual customer support when you need it most. Know where your payment is in the bank transfer process and see when HPU receives your payment. Housing and Financial Aid refunds have an automatic process in place for refunds to those who meet the criteria. There is no need for the student to request this process. Should you see a credit on your account, you have two options: 1) leave the credit where it is and it will apply to future charges with Hawaii Pacific University, or 2) request a refund on the credit. A refund can only be issued IF THERE IS A VALID CREDIT ON YOUR ACCOUNT. You can request a refund by filling out and returning the Refund Request Form to ar@hpu.edu. Any refund will go to the MAILING ADDRESS as it appears on Pipeline. Please make sure to keep your contact information up-to-date. If you need assistance updating your personal information, please view the Registrar's page on updating personal information. After your request is received, please allow 7-10 business days for processing.